Posted on 2007-10-31, updated at 2008-07-20. By anonymous. This book will take the reader through the process of developing an entire suite of enterprise applications using the .NET Framework. Specifically, we will go in depth on all key aspects of enterprise application development using the full power of ASP.NET and C#. 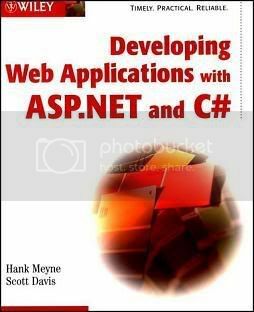 Each chapter will explain its topics by example, and at the end of the book, you will have an application that touches on many of the things that can be done in a Web application, and all in the .NET way. We believe that we can help the reader understand the theories behind the features of ASP.NET and, at the same time, give real-world examples that would likely be a part of a large-scale system. As each chapter progresses, we will add functionality to the overall system using the features that are relevant to the chapter. In addition, we will include multiple ways of doing things, where applicable, because your applications will have different requirements. We wonâ€™t hold back on the .NET Framework either; although the book is specifically for teaching how to write ASP.NET Web apps, we will try to include as much of the base class functionality of .NET as we can while keeping with the overall sample. We will also try to do things in C# that show off the power and features of the language. We wonâ€™t try to keep the examples too simple for fear of the readerâ€™s not knowing enough about the particular language. This is a book about C#, too, and it will include many nontrivial examples of the language throughout. This book is for programmers looking for an in-depth look at ASP.NET. The concepts and examples provided range from beginner to advanced level. All examples in this book were written using Visual Studio .NET, on both Windows 2000 Professional and Windows 2000 Server. Before running any of the examples, make sure Internet Information Services is installed and running.